Keystone Bank Partners Edo State Government On Waste Management - e-NIGERIA! Recently, Keystone bank partnered Edo State government on waste management in the state. 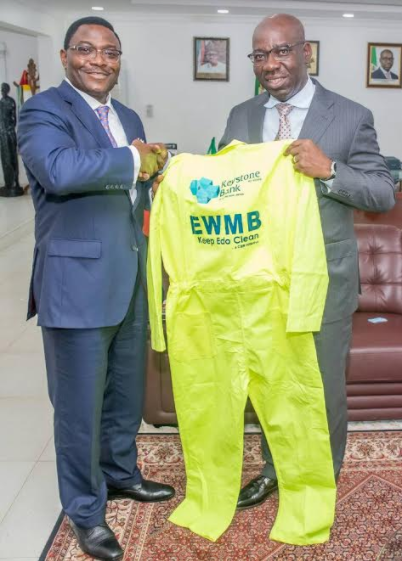 Seen here in is, Mr. Obeahon Ohiwerei, MD/CEO, Keystone Bank Limited and His Excellency, the Executive Governor of Edo State, Mr. Godwin Obaseki during the presentation of sweepers’ jacket by the bank to the Edo State government at the governor’s office in Benin City, Edo State recently.